It’s two weeks before harvest starts in Mendoza. 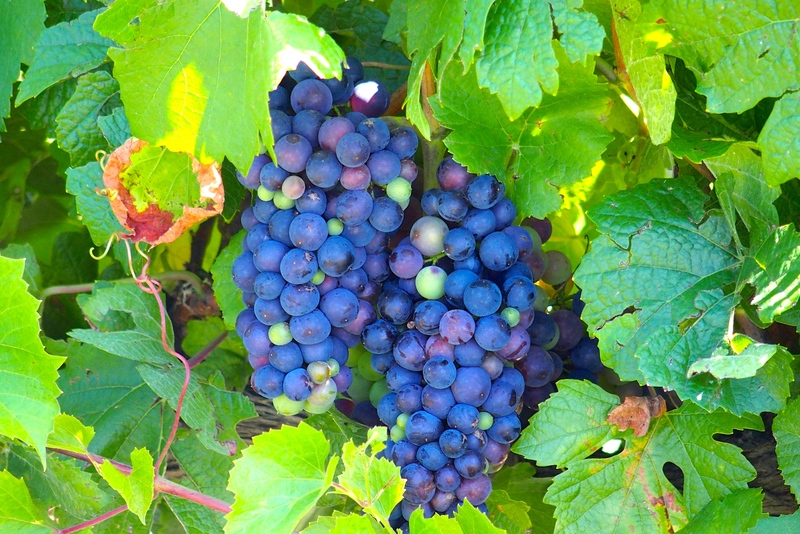 Wine makers are a bit nervous about this year’s vintage because the area has had twice the normal amount of rain this season. Many of the vineyards have netting over the vines because the grapes are very susceptible to hail damage. Acres and acres or hectares and hectares of grapes. The vines and grapes looked fabulous to us. 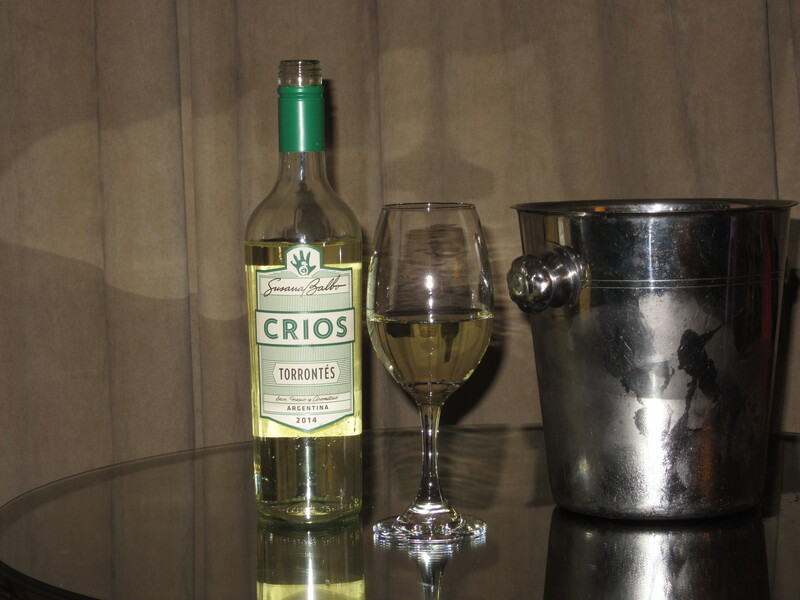 We’ve discovered a couple new favorite wines: Torrontes (white) and Malbec (tinto or red). These grapes will be wine in a few weeks. 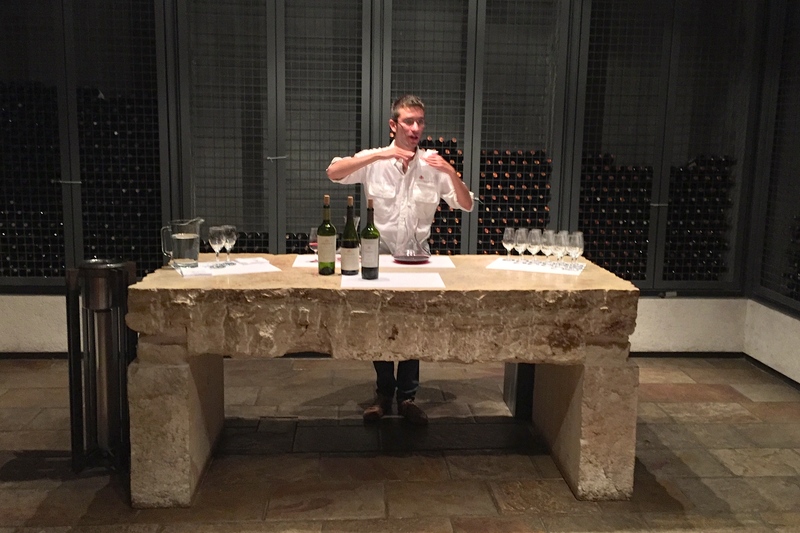 We’ve also, after a couple false starts, learned how to do wine tasting in Mendoza. It isn’t the rush-from-one-winery-to-another craze that we have in New York (for example, the Keuka Lake Wine Trail experience includes up to eight wineries in one day!) or even Napa and Sonoma. Instead, it’s a more casual tour and tasting and possible meal, spending several hours or a full afternoon at the bodega. This looks a bit like the painted barrels at the Keuka wineries a few years ago. The biggest difference with these wineries versus those back home (in the US) is that you MUST have a reservation here. We met with “Lo siento” (I’m sorry), “Completo” (full), “Cerrado” (closed) at four out of five wineries we tried to visit on our first day. Fortunately, we did get in to Bodegas Salentein. 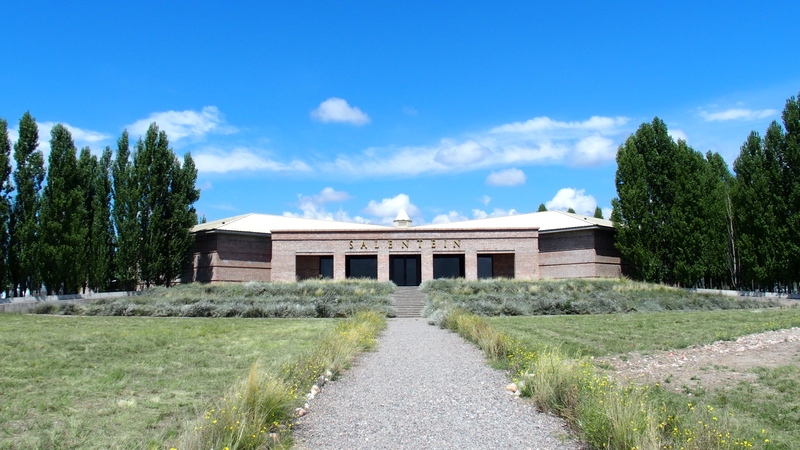 Salentein winery, designed to coexist with the natural environment. Our very enthusiastic guide told us the history of the winery, in existence only since 2000. Even though the winery is relatively new, the wines are delicious. Our host was full of information about the region, the winery, and all things wine. He told us that Argentina has a zero-tolerance blood alcohol level for drivers…except in Mendoza, where it’s 0.05% (not supported by fact checking, but an interesting perspective). Salentein winery, with the most informative wine-tasting ever. At Bully Hill on Keuka Lake we learned “Swirl. Sniff. Sip. Swish. Swallow.” Here the instructions were a bit more instructive and suggested a leisurely pace. Smell the wine and then notice the difference when you smell after you swirl it in your glass. The first sip opens the palate. Swirling the wine in your mouth provides an acidic shock, especially strong on the sides on the tongue. The second sip causes salivation. The third sip finally provides an opportunity to taste the wine for a symphony of flavor. Try it. It’s true. 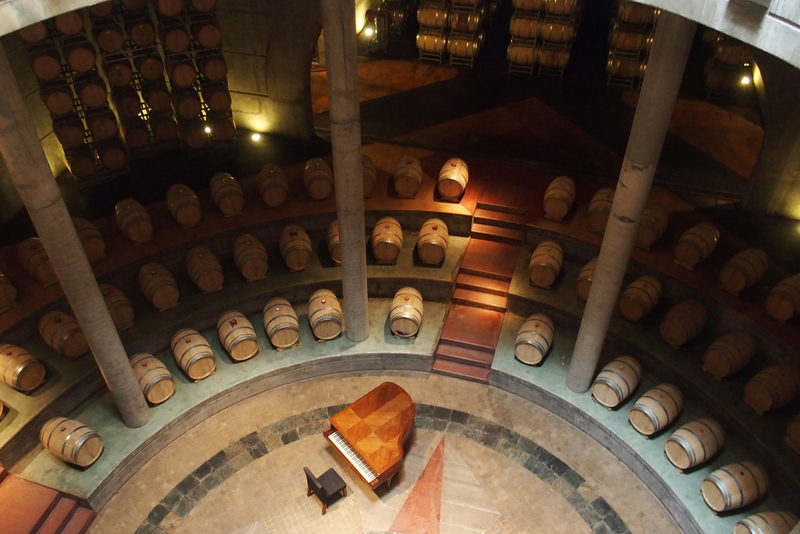 Speaking of symphonies, the Salentein cellar hosts piano recitals. Guests sit leaning against the barrels and appreciate fantastic acoustics. Mendoza has three primary wine areas. Salentein is in Valle de Uco, about 90 minutes south of Mendoza. It’s the newest wine region. 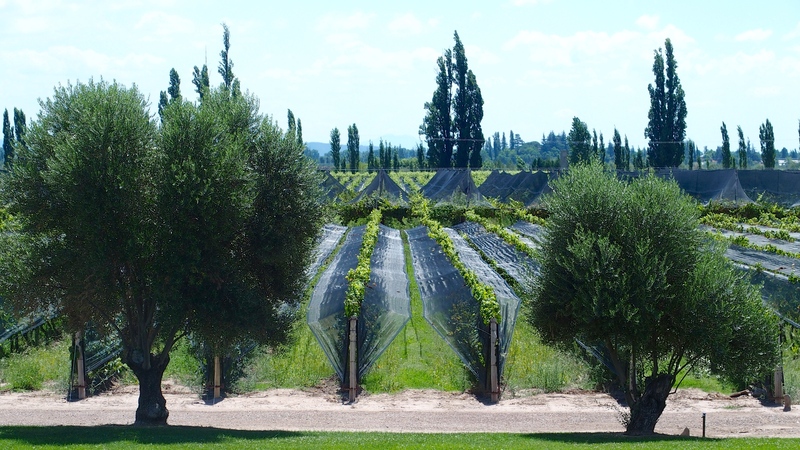 Much of the area around Mendoza is considered a desert, but the introduction of drip irrigation has allowed excellent controlled viticulture in the rocky soil. 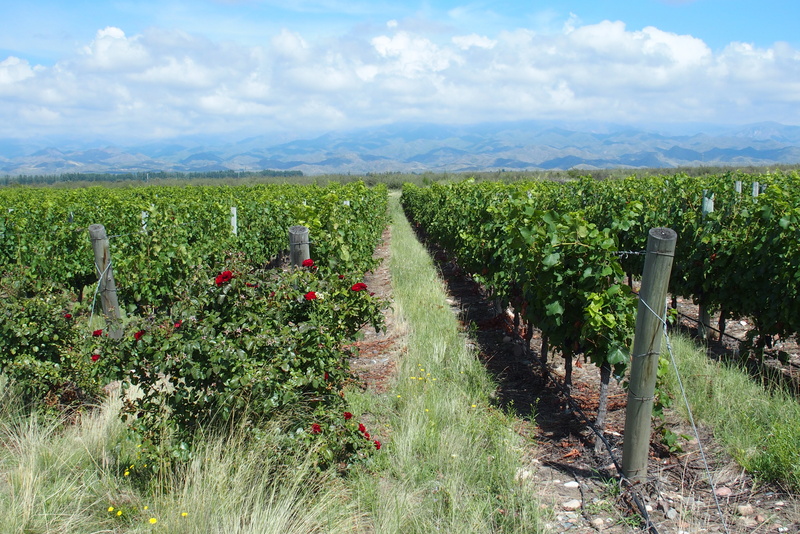 In fact, some of the best wines are now grown at higher elevations in the region, about 4,500 feet. 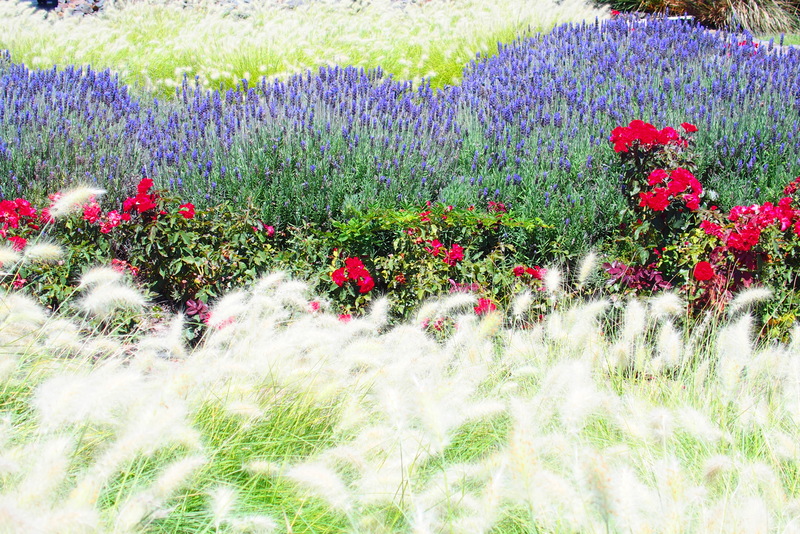 Leaving the space between vines untilled helps the soil to retain nutrients. Drip irrigation provides excellent moisture control, unless, of course, there is too much rain. We stopped at Dominio del Plata in the second area, Lujan de Cuyo. Interestingly Google Maps failed us here, putting most of the wineries in odd places. After driving in circles on gravel and potholed roads we found our way around using a photo of this map, 100% accurate. 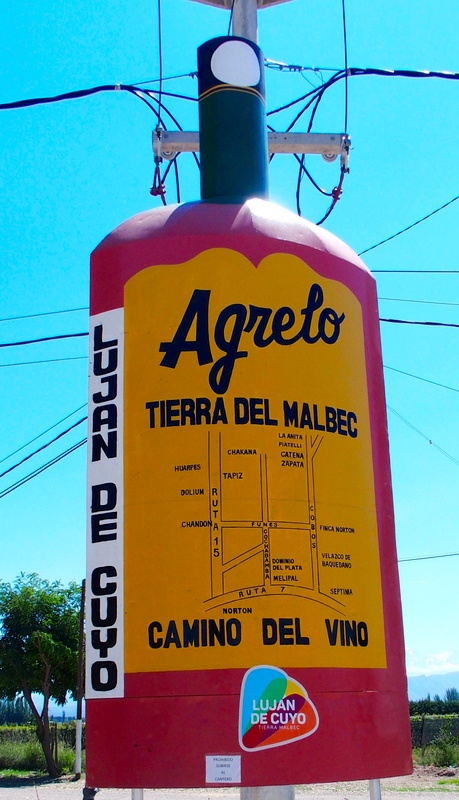 The best map we found for Lujan de Cuyo wine region. 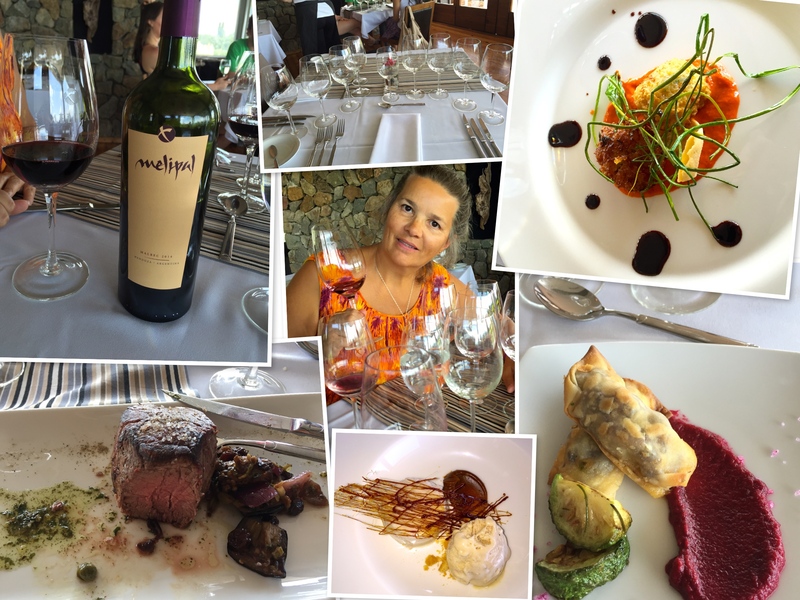 The folks at Dominio del Plata were too polite to tell us we were arriving after the end of lunch and tastings and served us some complimentary wines, even though they were busily getting ready for a Valentines Day event that night. This winery is where we learned about torrontes. It’s a fruity, but dry and citrusy white wine. Interestingly, the wine owes its development to a lady vintner, Susana Balbo. She is known as the Queen of Torrentes for her efforts to develop and promote this special wine. This winery too is relatively new, formed in 1999. We bought torrentes and rose malbec with the Crios label for under $15 for both. On another day we were armed with reservations. 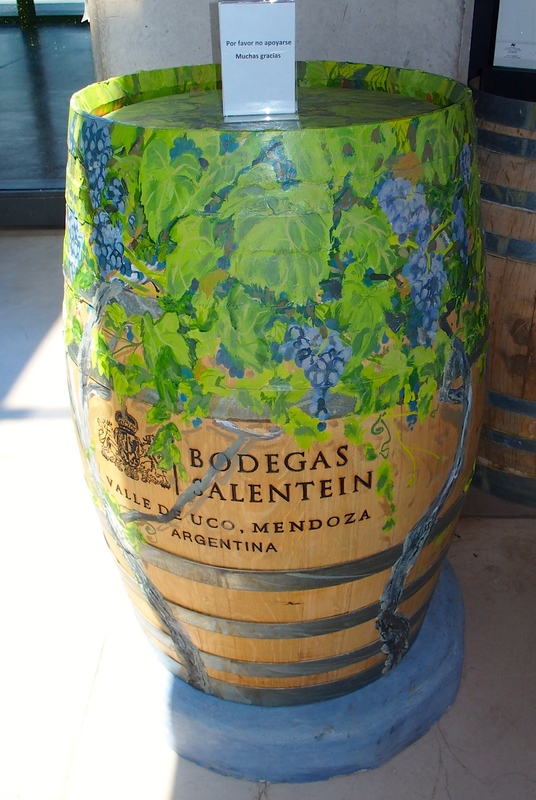 We visited Bodega Catena Zapata, one of the oldest wineries in Argentina, also in Lujan de Cuyo. It represents a merger of Italian and Argentinean, the Catena and Zapata families, and was founded in 1902. 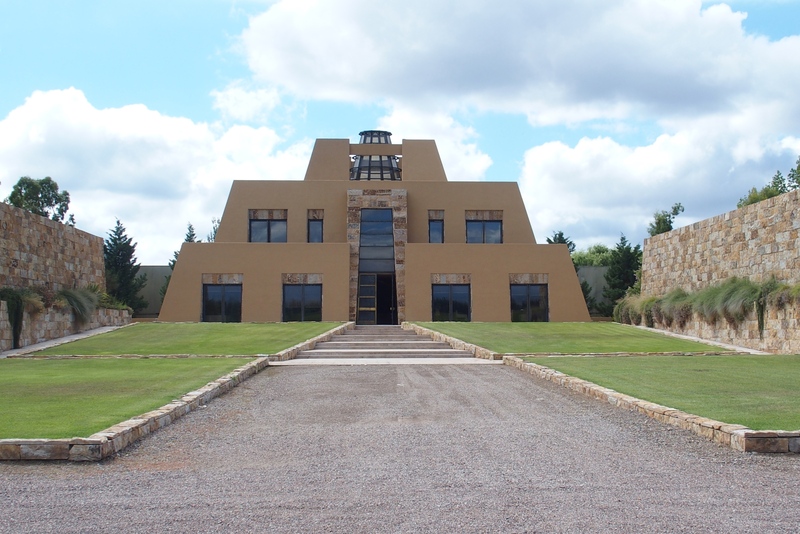 A modern bodega and the characteristic logo was established using a Mayan pyramid design signifying that this is an American (as in “the Americas”) wine, not like traditional Italian wines. Catena Zapata, possibly the best wines in Mendoza. This winery too has a modern influence from a woman. Laura Catena is from the fourth generation of the wine-making family. 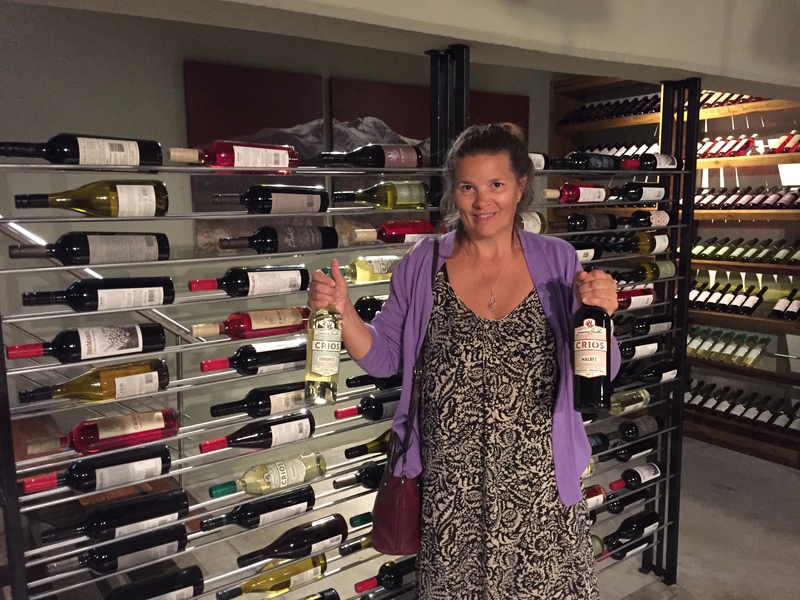 Although she earned medical degrees from Harvard and Stanford and works as an emergency physician in California, she also visits the winery regularly to provide direction. 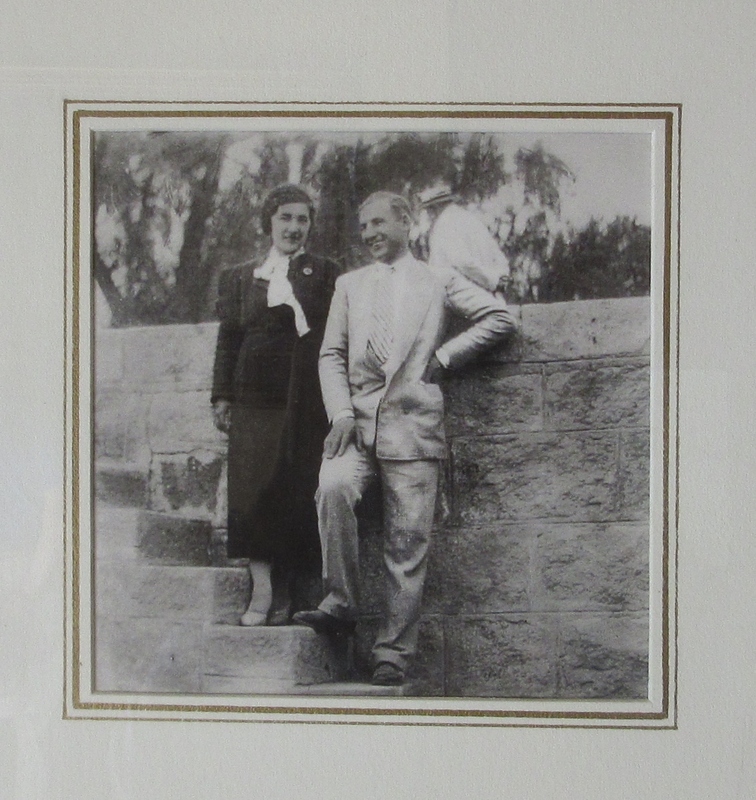 Her scientific approach enabled a better understanding of the interaction of sunlight at high altitude with the grapes, which allowed the development of the “highest” wine, Alta, grown at 4,757 feet. Looking down on one of the Zapata vineyards. This landscaping looks like it could be a Mayan symbol, a bird maybe? 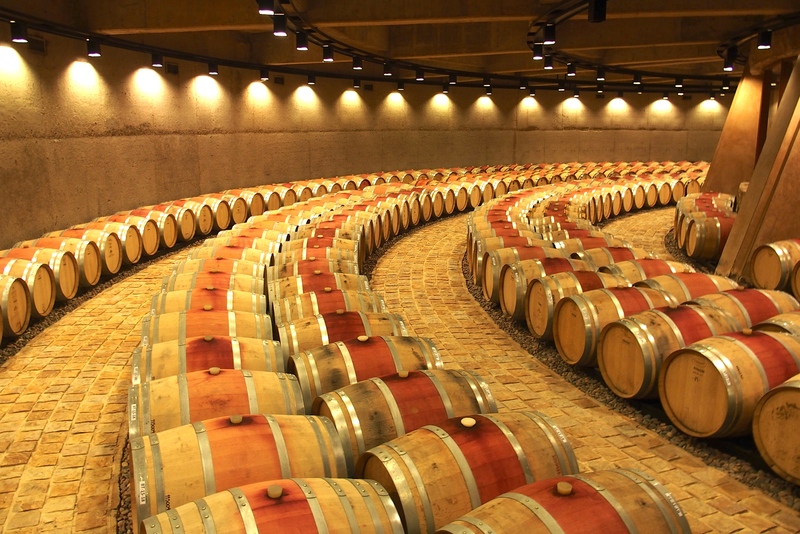 All the Zapata wines are aged in oak barrels. US barrels provide a buttery flavor and French barrels invoke a spicy flavor. The barrels are toasted inside for extra flavor. Zapata uses a “medium” toast. Thousands of oak barrels rather than steel tanks at Zapata. Our next winery was Melipal. Second time was the charm here. 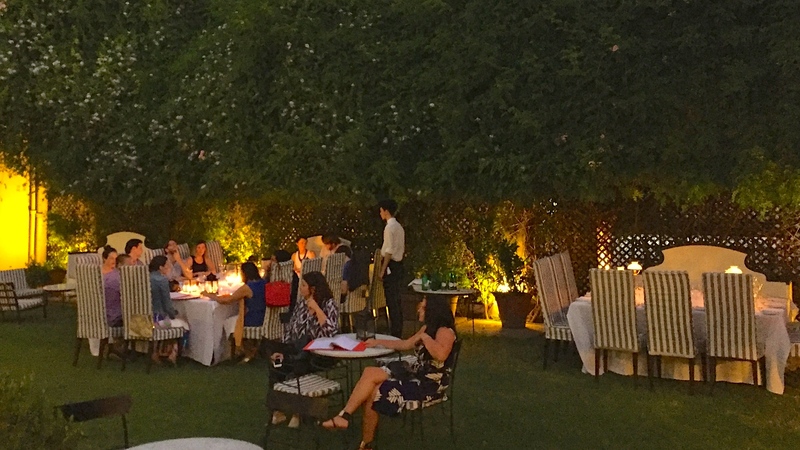 We were turned away on our first visit late on a different day, but the grounds and small dining area looked so appealing we had to come back. This time we did just a tasting with lunch, not a tour. Hardly a tasting, actually a five-course meal! Lomo (beef) to postres (dessert) and everything in between at Melipal was delicious. After this, it was time for siesta, a nice nap after lunch before dinner at 1884 Francis Mallmann. 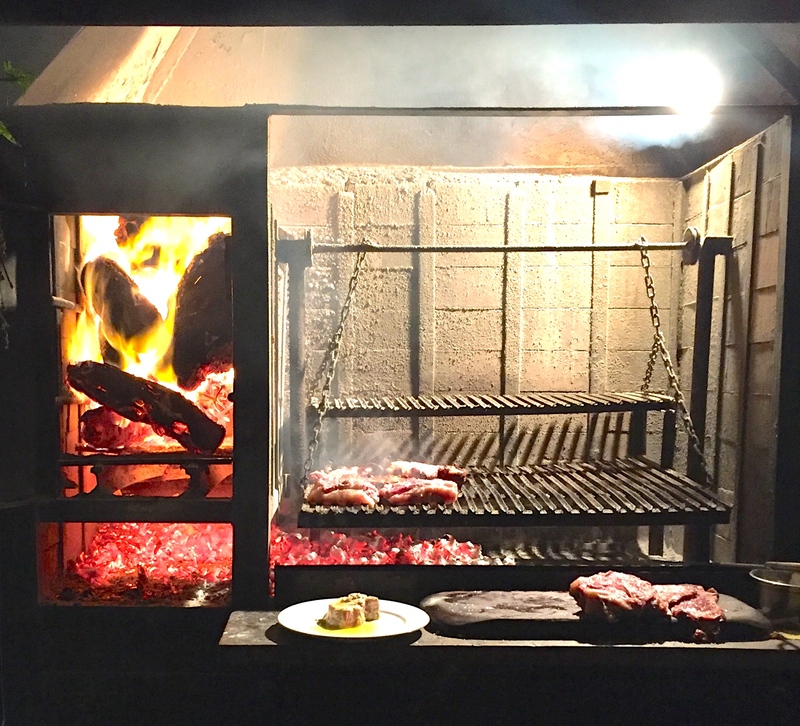 A renowned Argentinean chef, Francis Mallmann is known for his cooking with open fire. Coming full circle, the restaurant is a joint venture with Zapata. The outdoor “kitchen” at Mallmann. The cooking with fire had several stations. The grill at the top left (in the photo above) was for steaks and other meats. The rounded hut at the right was the asador for roasting whole goat and lamb. The open fire at the front had vegetables and fruits roasting and sauces boiling…and added plenty of heat to the eating area. The wood fire on the left drops down hot coals which are moved to the right to cook the meat on the grill. Michael had the seven-hour roasted lamb, so tender he wasn’t even given a steak knife. The dining area is outside. At the end of the night our clothes smelled like we had been at a campfire. Our final day in Mendoza included a three-hour lunch at Bodega Familia Zuccardi, another of Mendoza’s best wineries. 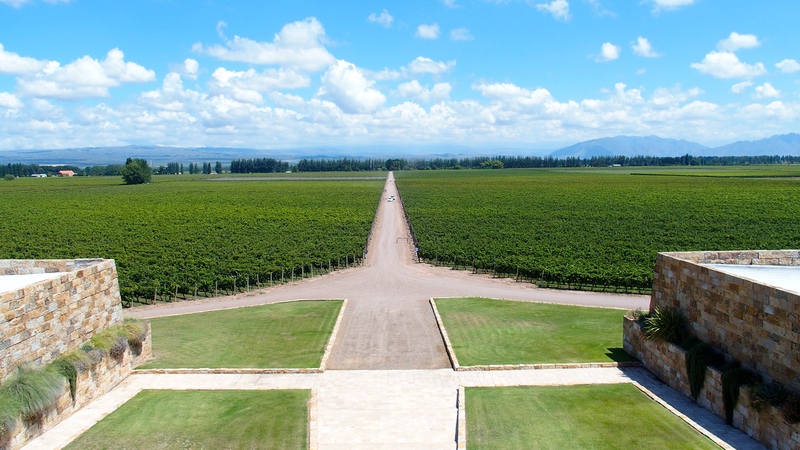 This is in the third Mendoza region, Maipu, although this winery also has some grapes at the higher altitudes. 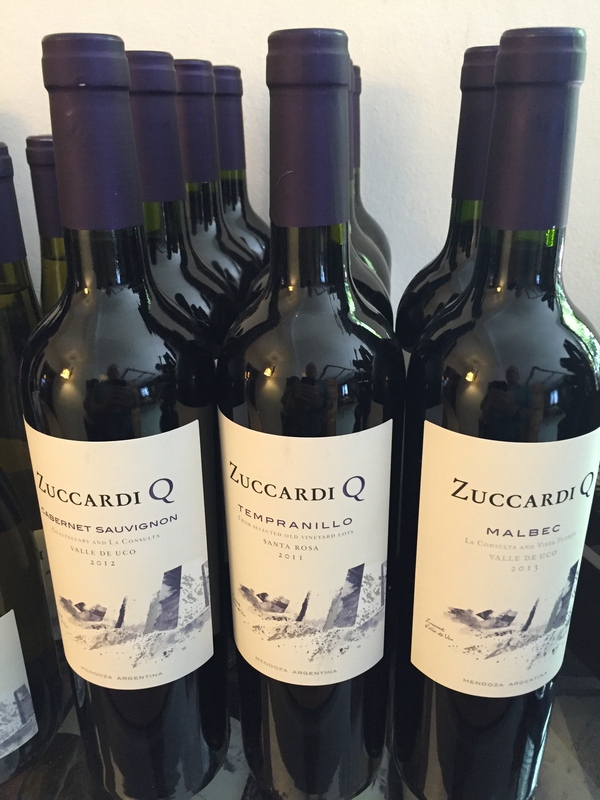 Zuccardi Q for quality. Some of these wines are available in the US, even at Costco! We bypassed the tour for a tasting lunch, quite a gourmet feast accompanied by six wines! (See the food photo below.) Courses in the three-hour meal included (clockwise from top): 1 basil, cherry tomato and garlic-fennel, blue cheese pear “snacks.” 2 garden salad with a basil sorbet (served in a closed jam jar filled with smoke!) 3 rabbit tempura with vegetables 4 tasting teas with delicious mini-alfajores. 4 vacuum-packed lamb with chard blinis. 5 corn cake, trout and avocado salad. 6 breads with olive oil cream. 7 basil rocks and frozen foam, watermelon, and caramelized tomatoes. 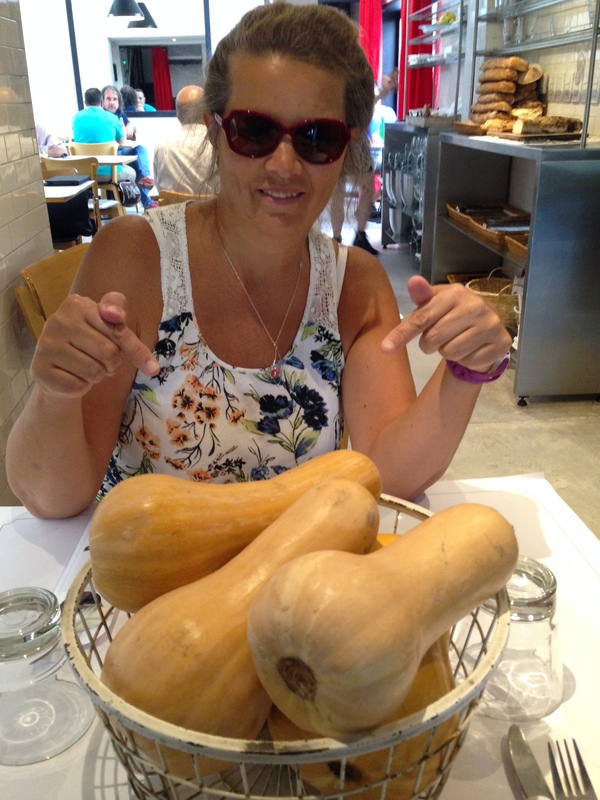 One of Mallmann’s trainees, chef Vanina Chimeno, created an excellent restaurant that is a great alternative after meat overload. 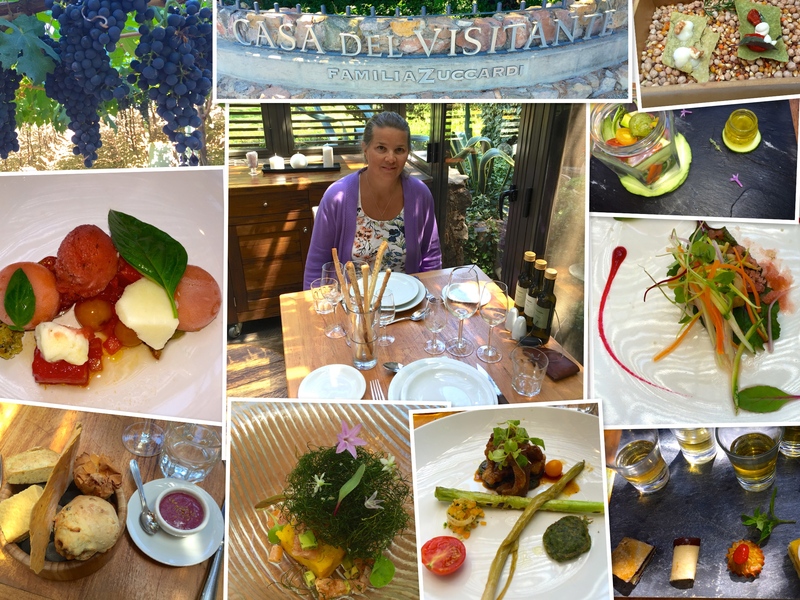 We had lunch and dinner at Maria Antonieta on our first day in Mendoza. Lovely, organic produce with a cleansing cucumber lemonade instead of wine. The fresh produce as our centerpiece showed up in that day’s menu items. We’ve heard there is good wine in Chile too, so that’s where we head next. 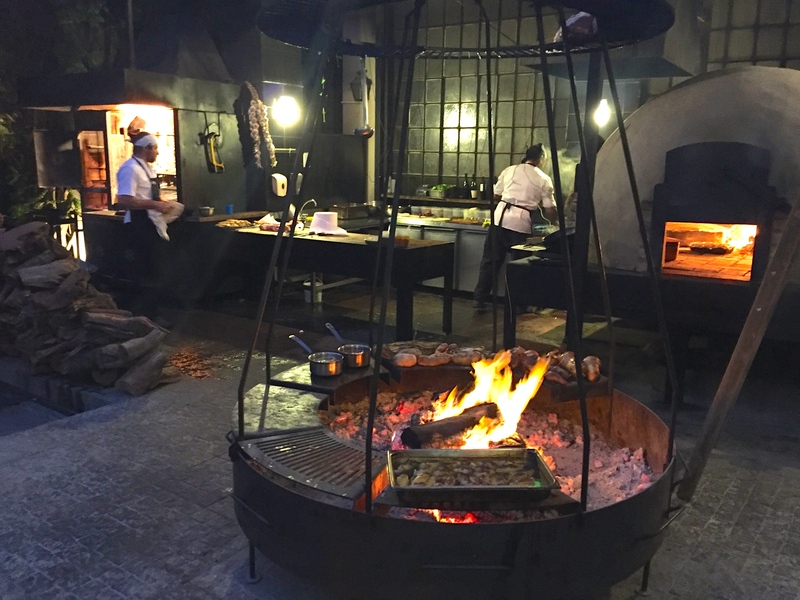 This entry was posted in Smell the Roses, Travel Journal and tagged Argentina, Catena Zapata, Dominio del Plata, food, Francis Mallmann, Maria Antonieta, Melipal, Mendoza, Salentein, wine, Zuccardi. Bookmark the permalink. I found the Malbec at our local liquor shop. $10.00 a bottle. I am not a red wine fan. Glad you enjoyed Mendoza. It’s a beautiful place. Where in Chile are you going? Santiago and Valparaiso. 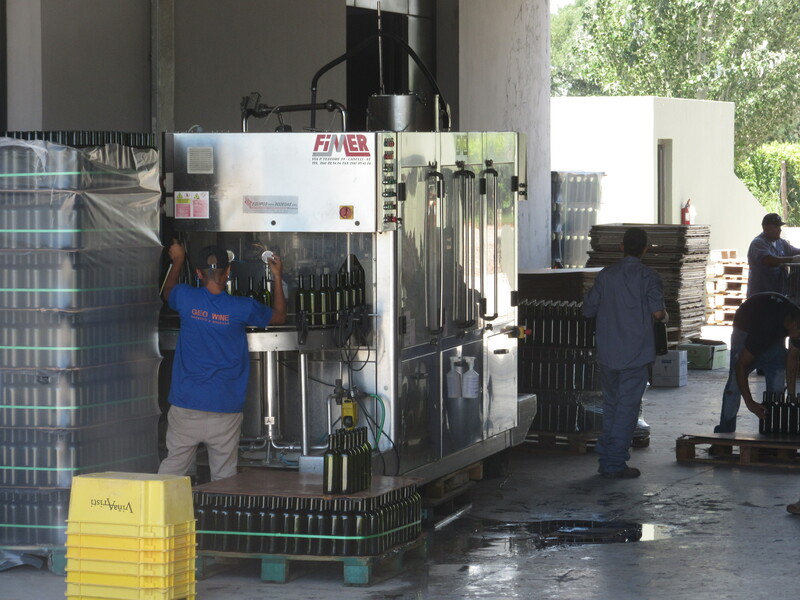 Just one winery, Kingston in Casa Blanca.